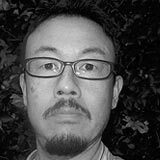 Goro Takano, born in the city of Hiroshima, is an assistant professor in the Faculty of Medicine at Saga University, where he teaches English and Japanese literature. He obtained his M.A. from the University of Tokyo (American Literature), and his Ph.D. from the University of Hawaii at Manoa (English/Creative Writing). His first novel, With One More Step Ahead, was published in US by BlazeVOX in 2009, and his first poetry collection titled Responsibilities of the Obsessed was published in US from BlazeVOX this year.